Michael Bowman http://michaelcbowman.com Since my elementary days, I've been both interested and passionate about video games and technology as a whole. Following that passion, I took the initiative to graduate from a technical school, and received my A+ and Network+ certifications from CompTIA. I'm well-versed in technical talk, but can get on people's level and speak plain English as well. I make it a point to explain things so that each individual can understand me, and I take pride in doing a thorough job in everything I do. I like to learn, and to share the things I learn, which is why I thought to create this blog in the first place. I’ve been thinking about my last post, and trying to figure out the best way to accomplish the goal I’m aiming for. While considering that, I’d stumbled upon this post. There is some language and some points here that can cause offense, but nonetheless it is an outpouring of someone’s perspective. If I am to help in any way, perspective is something I need to pay attention to. Otherwise, I will be ignored and will benefit nothing. First, after reading through this in its entirety, I spent some time wondering how those young men feel. I’ve come to the conclusion that I wouldn’t feel any different than they or the post-writer do. This was a very uncomfortable situation. This didn’t seem to be a thing done out of love for the young men, but in spite of the person who said they were “up to no good”. And then, once put on social media for all to see, it very much seems like the person written of was trying to make it look like they were one of the ‘good ones’. The user group I’ve created was made to give people who have been discouraged and pushed away a chance to learn and be encouraged. I’ve done this because I love my neighbor, and I long to serve others, even those who have been oppressed. I don’t care about receiving public praise. However, I’m at odds with myself. In order for people to know about this group, I have to be public about it. Also, in order to draw in teachers, it has to be as public as possible. So, in short, I have a statement to make, and a question to ask. My statement: I have no intention of being anyone’s savior. I only long to serve. I will be cautious with what I say and do to ensure I do not cross that line. My question: Would you please help me to see if and when I cross that line? A different perspective would help me to see if I’m misleading in any way about my intentions. It’s been quite awhile! I hope everyone is doing well, and is having a great holiday experience. I’ve been taking a break from many things as of late. I’ve been given the opportunity to serve and take part in good causes lately, and have been focusing more on my family especially during the holiday season. Also, I haven’t been blind to the issues that have been occurring in Ferguson, Staten Island, Cleveland and others. I’ve listened to stories like the one discussed between Scott Hanselman and Dr. Kortney Ziegler. I followed and reviewed information from both sides of Gamergate. I also discussed the issues that I saw personally. I’ve been contemplating and meditating on these things, and have made some comments. However, I’ve been burdened to do more than sit back and just talk about the problem. The thing is that I love my neighbor. I love my neighbor to the point of action. And so, I’ve been thinking on what I can do as a software developer. Being given a great example by the ones who love me despite my flaws, and the groups that I discussed in the inequality post, I’ve decided to follow suit. Thus, the == (Equality) User Group has been created. For the uninitiated, a single equal sign in many programming languages means assignment. If I have a variable called x, and I say x = 0, then I’m assigning 0 to x. However, a double equal sign is an equality operator. In that same example, if x is 0, when I ask if x == 0, I will receive a response of true. More info here. This group will focus on teaching software development to peoples of all backgrounds, creeds, colors, genders, ages. At this group’s meetings, a safe learning environment will be sustained for any and all who wish to learn and collaborate with other developers. This will be a place where interview practice can be done to help acquire employment. This will be a meeting where we will do what we can to acquire resources for the sake of each individual’s career in software development. This is my gift to you all this holiday season. Also, it’s a call to those who hear the same call to action as I have. Regardless of any excuse, you are welcome to come and assist. It will be appreciated, regardless of how small you think your contribution will be. Send me a note on any of my social sites or here in the comments with any ideas and/or if you wish to volunteer. I will begin planning the first meeting once the holiday season has completed, and will post it on here and on my social sites once a date has been decided. For the sake of this post, I’ll be explaining the Git route. Once Jasmine is cloned, go to the directory you cloned it in and unzip the file. A few directories (lib, spec, src) and the SpecRunner.html file are the result of the unzipping. Now that we’ve gotten all the installation out of the way, let’s take a quick peek at the examples. You’ll notice all the tests are in the spec file (short for specifications) and the code is in the src file (short for source). If we look in the source files, there’s not much but some short functions that are used just for showing off the tests. They don’t do much but set values or throw errors. In the spec file, we first see a ‘describe’ keyword. 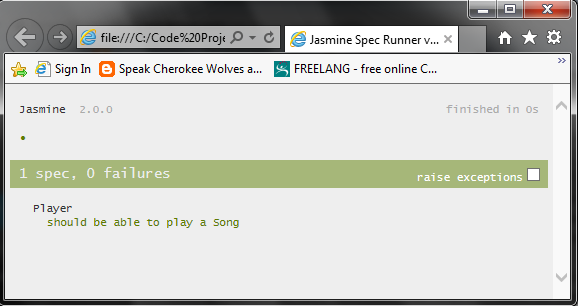 The ‘describe’ block of code has a title and a function. The function will hold all the actual tests. So, in essence, ‘describe’ blocks are suites of tests (which we’ll see in more detail later). Thus far, we’ve installed and ran a test, knocking the first crucial steps out. Next time, I’ll go into further detail on what’s possible with matchers, talk a bit on the more advanced features of Jasmine, and give some resources for further study and practice. Please feel free to comment if you have any questions or comments. Before I get started, this entry comes as a result of not only the backlash that Kira Markeljc received for doing a costume, but the greater backlash that people taking offense to it got for voicing their opinion. Kira and I had a nice and pleasant chat via Facebook. She expressed that she was not aware that what she did could be perceived as offensive and she did not know about black face. I am inclined to believe her. As of now she wants the focus to be taken off of her, which is fair. After seeing both sides, I’ve come to a conclusion that I’ll reserve, mostly because people can be very unreasonable when they’re anonymous (as I’ve learned with my time gaming, on Youtube (especially comments) and doing tech support). I’ve shown my stance in my actions and on this blog, and hope that people will not blindly trust anything from either side of a conversation, but yet do research to ensure we focus our energy in the right places. I’m sure some of you keeping up with my blog probably think it’s going to die off soon; that I’m not trying to update it. On the contrary, I want it to stay alive and well. I feel like I’ve learned a lot through writing it, and know at least a few of you have benefited from it. I don’t want to give either of those two things up. However, time and priority has changed for me lately, so I can only get a small post in weekly at this time. This week, on Saturday, the 11th of October, at 11:30am, I will be presenting my first session on software development…ever…I’ll let that sink in. For those who want to listen in, it’s at the always-free Columbus Code Camp (which, by the way, I find to be a very fitting place for my first session, considering that’s where I first was introduced to the development community). Lately, I’ve been preparing for that, so my time’s been pretty booked. Afterward, I plan on writing a post that will lay out the entire talk, along with slides and all resources. In the meantime, I hope to see some of you there!